Luke Callen is a hard-driving, finger-style guitar picker originally from the small river town of La Crosse, Wisconsin — in the heart of the Driftless region. Pulling from the traditions of American folk, blues, and country music, Luke has one foot in the past and one foot in the here and now. Echoing the voices of Pete Seeger, Woody Guthrie, Ramblin’ Jack Elliot and Townes Van Zandt, Luke crafts songs of people, places, and time in all of its forms. From the Mississippi Valley, learning by ear the songs of Harry Smith’s Anthology of American Folk Music, to campfires, classrooms, honky tonks and clubs across the country, Luke brings his humble sense of humor and humanity to any ear that will listen. 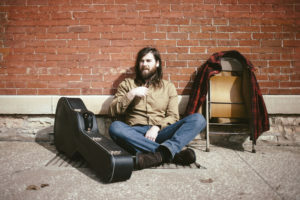 With his guitars, harmonicas, and banjo in tow, Luke has played hundreds of shows spanning both coasts, the American west, south and heartland. He has had the opportunity to provide support for Dom Flemons, The Dustbowl Revival, Kacy & Clayton, James McMurtry, Hayes Carll, Whiskey Shivers, Charlie Parr, The Lowest Pair, The Last Revel, Lilly Hiatt, Chicago Farmer, and Robbie Fulks among others.